Wildberry Harvest: Clinically proven to provide long term skin hydration. Coconut Water: Helps boost hydration and is rich in nutrients. Kale Extract: Powerful antioxidant. Stimulates keratin production. Bouncy and gel-like in consistency, this purifying cleanser will wash away sins from skin and pores. 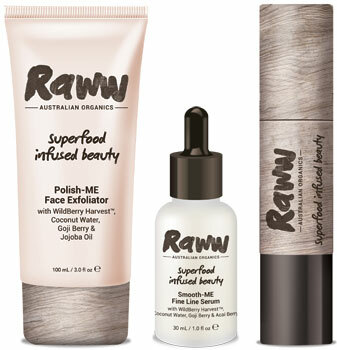 Infused with Kakadu Plum to keep skin firm and Avocado Oil to smooth and soothe. Delicious Coconut, Lime and Vanilla fragrance. Done with uneven skintone? We got you! This gentle exfoliator sweeps away stubborn dry patches, smoothing the texture of your face. WildBerry Harevest and Jojoba Oil keeps skin hydrated during the exfoliation process and Goji Berry works as an antioxidant, fighting off the first signs of ageing. Stay forever young with this super-charged serum. WildBerry Harvest plumps and hyrated whilst Goji Berry and Acai Berry keeps skin young and bright. This serum is super light-weight and melts into skin, delivering the raww benefits of a superfood belnd, helping to reduce fine lines. Ethereal glow for earthy beauties! A radiant highlighting and illuminating stick, enriched with WildBerry Harvest, Coconut Oil and Acai Berry for glowing skin. Subtle when first applied, this cream illuminator is buildable to a blinding highlight. Use the included buffing brush to beldn out to your desired level of shimmer. Natural Coconut and Vanilla fragrance.